The term Alport syndrome encompasses a group of inherited, heterogeneous disorders involving the basement membranes of the kidney and frequently affecting the cochlea and eye as well. [1, 2] See the image below. Electron micrograph of a kidney biopsy from a patient with Alport syndrome. Note the splitting and lamellation of the glomerular basement membrane (see arrows). Hypertension is usually detectable by the second decade of life. Edema and nephrotic syndrome are present in 30-40% of young adults with Alport syndrome; they are not common in early childhood, but their incidence progressively increases with age. With onset of renal insufficiency, symptoms of chronic anemia and osteodystrophy may become evident. Sensorineural deafness is a characteristic feature observed frequently, but not universally, in patients with Alport syndrome. About 50% of male patients with XLAS show sensorineural deafness by age 25 years, and about 90% are deaf by age 40 years. Diffuse leiomyomatosis of the esophagus and tracheobronchial tree has been reported in some families with Alport syndrome. Renal manifestations and deafness in this rare form of Alport syndrome are usually identical to those occurring in patients with XLAS, but renal failure may occur at a later age. Angiotensin-converting enzyme (ACE) inhibitors or angiotensin-receptor blockers (ARBs) should be administered to patients with Alport syndrome who have proteinuria with or without hypertension. Both classes of drugs apparently help to reduce proteinuria by decreasing intraglomerular pressure. Moreover, by inhibiting angiotensin II, a growth factor that is implicated in glomerular sclerosis, these drugs have a potential role in slowing sclerotic progression. Kidney transplantation is usually offered to patients with Alport syndrome who develop end-stage renal disease (ESRD). Recurrent disease does not occur in the transplanted kidney, and the allograft survival rate in these patients is similar to that in patients with other renal diseases. However, anti–glomerular basement membrane (anti-GBM) nephritis develops in a small percentage of transplant patients with Alport syndrome. a Autosomal recessive Alport syndrome (mutations spanning 5' regions of COL4A5 and COL4A6 genes). c Autosomal recessive Alport syndrome. The alpha-1 (IV) and alpha-2 (IV) chains are ubiquitous in all basement membranes (see Table 2, below), while the other type IV collagen chains have more restricted tissue distribution. The basement membranes of the glomerulus, cochlea, lung, lens capsule, and Bruch and Descemet membranes in the eye contain alpha-3 (IV), alpha-4 (IV), and alpha-5 (IV) chains, in addition to alpha-1 (IV) and alpha-2 (IV) chains. The alpha-6 (IV) chains are present in epidermal basement membranes. More than 300 mutations have been reported In the COL4A5 genes from families with XLAS. Most COL4A5 mutations are small; these include missense mutations, splice-site mutations, and deletions of less than 10 base pairs. Approximately 20% of the mutations are major rearrangements at the COL4A5 locus (ie, large- and medium-sized deletions). A particular type of deletion spanning the 5' ends of the COL4A5 and COL4A6 genes is associated with a rare combination of XLAS and diffuse leiomyomatosis of the esophagus, tracheobronchial tree, and female genital tract. In patients with Alport syndrome, no mutations have been identified solely in the COL4A6 gene. To date, only 6 mutations in the COL4A3 gene and 12 mutations in the COL4A4 gene have been identified in patients with ARAS. Patients are either homozygous or compound heterozygous for their mutations, and their parents are asymptomatic carriers. The mutations include amino acid substitutions, frameshift deletions, missense mutations, in-frame deletions, and splicing mutations. ADAS is rarer than XLAS or ARAS. Recently, a splice site mutation resulting in skipping of exon 21 in the COL4A3 gene was found in ADAS. The primary abnormality in patients with Alport syndrome—resulting in aberration of basement membrane—lies in the noncollagenous (NC1) domain of the C-terminal of the alpha-5 (IV) chain in XLAS and that of alpha-3 (IV) or alpha-4 (IV) chains in ARAS and ADAS. In the early developmental period of the kidney, alpha-1 (IV) and alpha-2 (IV) chains predominate in the GBM. With glomerular maturation, alpha-3 (IV), alpha-4 (IV), and alpha-5 (IV) chains become preponderant through a process called isotype switching. Evidence shows that alpha-3 (IV), alpha-4 (IV), and alpha-5 (IV) chains combine to form a unique collagen network. Abnormality of any of these chains, as observed in patients with Alport syndrome, limits formation of the collagen network and prevents incorporation of the other collagen chains. Evidence has demonstrated that isoform switching of type IV collagen becomes developmentally arrested in patients with XLAS. This leads to retention of the fetal distribution of alpha-1 (IV) and alpha-2 (IV) isoforms and the absence of alpha-3 (IV), alpha-4 (IV), and alpha-5 (IV) isoforms. The cysteine-rich alpha-3 (IV), alpha-4 (IV), and alpha-5 (IV) chains are thought to enhance the resistance of GBM to proteolytic degradation at the site of glomerular filtration; thus, anomalous persistence of alpha-1 (IV) and alpha-2 (IV) isoforms confers an unexpected increase in the susceptibility of GBM to proteolytic enzymes, leading to basement membrane splitting and damage. How defective collagen chains result in glomerulosclerosis remains unclear. Evidence now suggests that accumulation of type V and VI collagen chains (along with alpha-1 [IV] and alpha-2 [IV] chains) in the GBM occurs as a compensatory response to the loss of alpha-3 (IV), alpha-4 (IV), and alpha-5 (IV) chains. These proteins spread from a normal subendothelial location and occupy the full width of GBM, altering glomerular homeostasis and resulting in GBM thickening and impairment of macromolecular permselectivity, with subsequent glomerular sclerosis, interstitial fibrosis, and renal failure. Experimental studies implicate transforming growth factor beta (TGF-beta) and matrix metalloproteinases in the progression of renal disease in Alport syndrome. Further studies are needed to define their precise pathogenetic role and their potential relevance as therapeutic targets. Several reports describe families with hereditary nephritis associated with deafness, megathrombocytopenia (giant platelets), and, in some families, granulocyte abnormalities. Clinical features include bleeding tendency, macrothrombocytopenia, abnormalities of platelet aggregation (ie, Epstein-Barr syndrome), and, occasionally, neutrophil inclusions that resemble Dohle bodies (ie, May-Hegglin anomaly, Fechtner syndrome). In most patients, the autosomal dominant pattern of inheritance is observed. In only 2 reports, focal thickening, splitting, or lamellation of the GBM was identified. The basement membrane of these patients showed normal expression of a chain of type IV collagen. So far, the genetic loci involved remain unknown. All patients with Alport syndrome diffuse leiomyomatosis complex have been found to have deletions that span the 5' ends of the COL4A5 and COL4A6 genes. The cause of anti-GBM nephritis is unclear, but about 3-5% of males with Alport syndrome who undergo renal transplantation develop this disorder. These individuals usually have early onset Alport syndrome with clinically significant hearing loss and ESRD by about age 20 years. Patients who develop anti-GBM nephritis possess circulating anti-GBM antibodies. In persons with ARAS, antibodies predominantly bind to the alpha-3 (IV) and alpha-4 (IV) collagen chains, whereas most antibodies in patients with XLAS bind to the alpha-5 (IV) chain. [7, 8, 9] The antigens recognized by the anti-GBM antibodies are not expressed in the native kidneys of patients with Alport syndrome but are present in the transplanted kidneys. At present, the only way to determine whether a patient with Alport syndrome will develop posttransplant anti-GBM nephritis is to perform the transplant. Certain patients, however, are at very low risk for developing posttransplant anti-GBM nephritis, including those with normal hearing, patients with late progression to ESRD, and females with XLAS. Retransplantation in most patients results in recurrence of anti-GBM nephritis despite the absence of detectable circulating anti-GBM antibodies before transplantation. Because of excellent graft survival rates and a very low incidence of clinical anti-GBM disease, renal transplantation is not contraindicated in patients with Alport syndrome. However, in patients who have already lost an allograft due to posttransplant anti-GBM nephritis, the optimal management is uncertain because of the high likelihood of recurrence and subsequent allograft loss. A rare disease, Alport syndrome accounts for approximately 2.2% of children and 0.2% of adults with ESRD in the United States. In Europe, Alport syndrome accounts for 0.6% of patients with ESRD. The common X-linked form of Alport syndrome leading to ESRD predominantly affects male individuals. Hematuria is usually discovered during the first years of life in males with Alport syndrome. If individuals do not have hematuria during the first decade of life, they are unlikely to have Alport syndrome. Proteinuria is usually absent in childhood, but this condition eventually develops in males with XLAS and in males and females with ARAS. Hearing loss and ocular abnormalities are never present at birth; they usually become apparent by late childhood or early adolescence, generally before the onset of renal failure. Renal prognosis in Alport syndrome depends on the kind of mutation causing the condition. The probability of ESRD in people younger than 30 years is significantly higher (90%) in patients with a large rearrangement of the COL4A5 gene than it is in those with minor mutations (50-70%). Furthermore, the rate of progression of renal disease is fairly constant among patients within a particular family but shows significant variability between different families. Patients with a family history of juvenile-type Alport syndrome or with early onset deafness and ocular changes typically progress to ESRD by age 20-30 years. Female patients with XLAS tend to have mild renal disease, with many surviving to old age. However, studies have shown significant renal morbidity in female patients who develop proteinuria and hearing loss. [14, 15] The reported probability of ESRD in female patients is 12% by age 40 years, 30% by age 60 years, and 40% by age 80 years. Risk factors for progression to ESRD are episodes of gross hematuria in childhood, nephrotic range proteinuria, and diffuse GBM thickening on examination with an electron microscope. The renal prognosis for all patients, male and female, with autosomal recessive disease is poor, with most progressing to ESRD. Provide pre-ESRD education for patients with Alport syndrome to discuss various options and issues regarding renal replacement therapy (eg, dialysis, transplantation). Arrange dietary counseling for patients approaching ESRD. Avoid administering nephrotoxins in patients with Alport syndrome, including over-the-counter nonsteroidal analgesic agents. In asymptomatic patients, stress the importance of yearly physical examinations and laboratory evaluations. Advise patients to receive audiometry and visual testing every 2 years. Advise parents affected with Alport syndrome and potential carriers of the disorder to obtain genetic counseling. For patient education information, see Urine and blood Analsis. Zhang Y, Ding J. Renal, auricular, and ocular outcomes of Alport syndrome and their current management. Pediatr Nephrol. 2017 Sep 1. [Medline]. Watson S, Bush JS. Alport Syndrome. 2017 Jun. [Medline]. [Full Text]. Gross O, Perin L, Deltas C. Alport syndrome from bench to bedside: the potential of current treatment beyond RAAS blockade and the horizon of future therapies. Nephrol Dial Transplant. 2014 Sep. 29 Suppl 4:iv124-30. [Medline]. Kashtan CE. Familial hematuria. Pediatr Nephrol. 2009 Oct. 24(10):1951-8. [Medline]. [Full Text]. [Guideline] Savige J, Gregory M, Gross O, Kashtan C, Ding J, Flinter F. Expert guidelines for the management of Alport syndrome and thin basement membrane nephropathy. J Am Soc Nephrol. 2013 Feb. 24(3):364-75. [Medline]. Gross O. Understanding renal disorders as systemic diseases: the fascinating world of basement membranes beyond the glomerulus. Nephrol Dial Transplant. 2008 Jun. 23(6):1823-5. [Medline]. Olaru F, Luo W, Wang XP, Ge L, Hertz JM, Kashtan CE, et al. Quaternary Epitopes of a345(IV) Collagen Initiate Alport Post-Transplant Anti-GBM Nephritis. J Am Soc Nephrol. 2013 May. 24(6):889-95. [Medline]. [Full Text]. Wang XP, Fogo AB, Colon S, Giannico G, Abul-Ezz SR, Miner JH, et al. Distinct epitopes for anti-glomerular basement membrane alport alloantibodies and goodpasture autoantibodies within the noncollagenous domain of alpha3(IV) collagen: a janus-faced antigen. J Am Soc Nephrol. 2005 Dec. 16(12):3563-71. [Medline]. Borza DB. Autoepitopes and alloepitopes of type IV collagen: role in the molecular pathogenesis of anti-GBM antibody glomerulonephritis. Nephron Exp Nephrol. 2007. 106(2):e37-43. [Medline]. [Full Text]. Kashtan CE. Alport syndrome and thin glomerular basement membrane disease. J Am Soc Nephrol. 1998 Sep. 9(9):1736-50. [Medline]. Armstead S, Hellmark T, Wieslander J, Zhou X, Saxena R, Rajora N. A case of Alport syndrome with post-transplant anti-glomerular basement membrane disease despite negative anti-glomerular basement membrane antibodies by ELISA treated with plasmapheresis and intravenous immunoglobulin. Case Report Transpl. 2013. In press. United States Renal Data System. 2017 Annual Data Report. USRDS. Available at http://www.usrds.org/adr.htm. Accessed: December 30, 2017. Massella L, Gangemi C, Giannakakis K, Crisafi A, Faraggiana T, Fallerini C, et al. Prognostic Value of Glomerular Collagen IV Immunofluorescence Studies in Male Patients with X-Linked Alport Syndrome. Clin J Am Soc Nephrol. 2013 May. 8(5):749-55. [Medline]. [Full Text]. Jais JP, Knebelmann B, Giatras I, De Marchi M, Rizzoni G, Renieri A, et al. X-linked Alport syndrome: natural history and genotype-phenotype correlations in girls and women belonging to 195 families: a "European Community Alport Syndrome Concerted Action" study. J Am Soc Nephrol. 2003 Oct. 14(10):2603-10. [Medline]. Rheault MN. Women and Alport syndrome. Pediatr Nephrol. 2012 Jan. 27(1):41-6. [Medline]. [Full Text]. Mallett A, Tang W, Clayton PA, Stevenson S, McDonald SP, Hawley CM, et al. End-stage kidney disease due to Alport syndrome: outcomes in 296 consecutive Australia and New Zealand Dialysis and Transplant Registry cases. Nephrol Dial Transplant. 2014 Dec. 29 (12):2277-86. [Medline]. Ahmed F, Kamae KK, Jones DJ, Deangelis MM, Hageman GS, Gregory MC, et al. Temporal macular thinning associated with x-linked alport syndrome. JAMA Ophthalmol. 2013 Jun 1. 131(6):777-82. [Medline]. Citirik M, Batman C, Men G, Tuncel M, Zilelioglu O. Electron microscopic examination of the anterior lens capsule in a case of Alport's syndrome. Clin Exp Optom. 2007 Sep. 90(5):367-70. [Medline]. Patey-Mariaud de Serre N, Garfa M, Bessiéres B, Noël LH, Knebelmann B. Collagen alpha5 and alpha2(IV) chain coexpression: analysis of skin biopsies of Alport patients. Kidney Int. 2007 Aug. 72(4):512-6. [Medline]. Gubler MC. Diagnosis of Alport syndrome without biopsy?. Pediatr Nephrol. 2007 May. 22(5):621-5. [Medline]. Artuso R, Fallerini C, Dosa L, Scionti F, Clementi M, Garosi G, et al. Advances in Alport syndrome diagnosis using next-generation sequencing. Eur J Hum Genet. 2012 Jan. 20(1):50-7. [Medline]. [Full Text]. Daina E, Cravedi P, Alpa M, Roccatello D, Gamba S, Perna A, et al. A multidrug, antiproteinuric approach to alport syndrome: a ten-year cohort study. Nephron. 2015. 130 (1):13-20. [Medline]. Charbit M, Gubler MC, Dechaux M, Gagnadoux MF, Grünfeld JP, Niaudet P. Cyclosporin therapy in patients with Alport syndrome. Pediatr Nephrol. 2007 Jan. 22(1):57-63. [Medline]. Kelly YP, Patil A, Wallis L, Murray S, Kant S, Kaballo MA, et al. Outcomes of kidney transplantation in Alport syndrome compared with other forms of renal disease. Ren Fail. 2017 Nov. 39 (1):290-293. [Medline]. Mojahedi MJ, Hekmat R, Ahmadnia H. Kidney transplantation in patients with alport syndrome. Urol J. 2007 Fall. 4(4):234-7. [Medline]. Webb NJ, Shahinfar S, Wells TG, Massaad R, Gleim GW, McCrary Sisk C, et al. Losartan and enalapril are comparable in reducing proteinuria in children with Alport syndrome. Pediatr Nephrol. 2013 May. 28(5):737-43. [Medline]. Callís L, Vila A, Carrera M, Nieto J. Long-term effects of cyclosporine A in Alport's syndrome. Kidney Int. 1999 Mar. 55(3):1051-6. [Medline]. 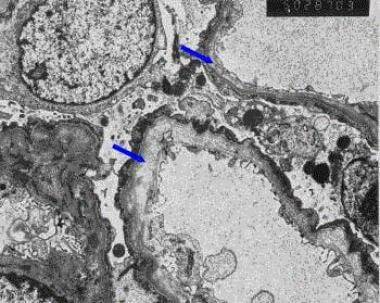 Electron micrograph from a patient with Alport syndrome revealing the typical splitting and splintering of the glomerular basement membrane (original magnification X3000). Courtesy of Glen S. Markowitz, MD, Department of Pathology, Columbia University College of Physicians and Surgeons, New York. Disclosure: Received honoraria from e-medicine for authoring review articles. Disclosure: Received none from Coinventor on patents submitted for the use of NGAL as a biomarker of kidney injury for none.